The Mighty No. 9 heroine, Call, was selected to be "Call F" from the Kickstarter backer vote. 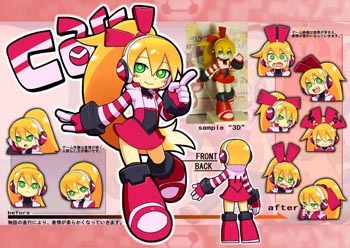 Comcept USA has revealed the final design for Call, the heroine of Mighty No. 9. Before Kickstarter backers chose the final design, "Call F," various illustrators came up with nine designs and put them to a vote. Inti Creates' Yuuji Natsume created Call F, the winning design which received 43.39% of the votes. Call is a more of a pure robot because she was not given the human characteristics main character Beck has. She has green robotic eyes, a predominately red outfit with jacket, top, and skirt, headphones, and she's a redhead. Call E, a pilot-esque robot, was a very close second with 41.14% of the vote. Call H, pigtailed robot with a scarf and dress, was much less popular with only 15.47% of the vote. Mighty No. 9 is the spiritual successor to Capcom's Mega Man series. Director Keiji Inafune launched the Kickstarter campaign at PAX Prime, and it reached the initial $900,000 funding goal in just under four days. By the time the campaign ended a month later, it had raised over $4 million when factoring in Paypal donations. It also reached each of its stretch goals. The game will be available for PC, Mac, Linux, Vita, 3DS, PS4, Xbox One, PS3, Xbox 360, and Wii U. The estimated release date is April 2015. The Mighty No. 9 team teased an announcement for New Year's. As to what it is, who knows? But we won't have to wait very long to find out.